This tropical colonial capital city of Merida is slowly being discovered as an ideal place to experience a leisurely pace of life while offering a wide array of things to see and do. Founded in 1542 by Spanish conquistadors, Merida is situated 200 miles west of Cancun in the center of the Yucatan peninsula. In recent years, an influx of expatriates from the United States and other parts of the world and a thriving tourism business have resulted in the city becoming a tourist destination. One of the few Spanish colonial cities in a tropical location Merida offers the visitor amazing history, wonderful nearby beaches and a friendly relaxed atmosphere. The city's modern international airport provides easy travel from the United States, with direct flights from the major carriers to most US cites as well as connecting flights via Mexico City. In addition connections to Europe via Cancun with Air Europa, Thomas Cook Airlines , Iberia, etc, are numerous. 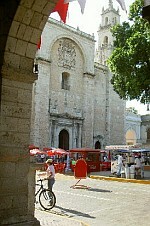 Inexpensive taxis and good bus service make getting around Merida easy. Car rental in the city starts at 25$ a day! Adding to the city's attraction are its very low crime rate for a city of its size - 800,000 - its excellent infrastructure, health care and its extreme cleanliness. Many of Merida's tourist attractions are in easy walking distance of the city's historic center where you will find numerous restaurants, boutiques and hotels. The main square, Plaza Grande, and surrounding streets are very lively in the evenings and closed to traffic every Saturday evening and all day Sunday with great live music and cultural performances. Saturday evenings in Merida's historical center are particularly lively with Cuban salsa and Latin Music to be heard throughout the downtown. Restaurants and cafes set up tables on the closed streets and the city takes on a carnival type atmosphere. Every Sunday traffic is closed off to the historical center and the weekly fair "Merida en Domingo" is held with music, dance, handicrafts and food vendors in the various squares. Concerts are free and provide a wide range of international and local performers with emphasis on both Yucatecan and Cuban culture. Cuba has a long history of trade with the Yucatan and shares is cultural history. Local cuisine is a mouthwatering mixture of Mayan, Caribbean, European and even Middle Eastern offerings. The streets surrounding the main square have every possible type of culinary experience from street vendors to luxury restaurants. For a completely difference culinary treat take a morning to explore the daily market Lucas de Galvez. It is an amazing experience of sites and smells of a variety of local foods and produce. Next to Lucas De Galvez is Mercado de Artesanias, another market where local artisans and craftspeople come to sell their wares and extremely reasonable prices. Merida is a great walking city and most interesting sites are within a half hours walk from the main square. You can easily wander the streets of the historical center to admire the wonderful European inspired architecture...In particular the mansions of the Paseo Montejo. To get a glimpse inside some of the beautiful historic homes you can take the Merida House & Garden Tour every Wednesday at 9:45 am. from the Merida English Library. The city is home to some 20,000 expatriates who have renovated many of the abandoned colonial mansions throughout the historical center. 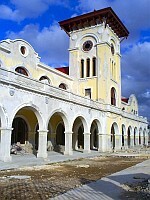 The New Merida Art School, which will open this year in the old train station is a must see. 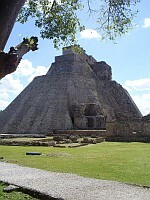 In addition the city has numerous art and archeological museums. 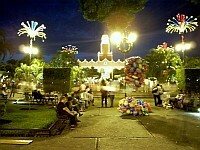 Art galleries, from International to local, can be found around the Santa Ana Square. Merida's location makes it the perfect departure point for amazing nearby excursions...From restored Haciendas, to hundreds of significant Mayan archaeological sites such as the ruins of Uxmal and Chichen Itza. 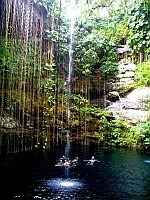 In addition there are natural wonders such as the Cenotes of Cuzama (underground freshwater swimming holes), the coastal Celestun preserve, home to thousands of pink flamingos , clean beaches and the warm waters of the Gulf of Mexico. Accommodation in the city ranges from inexpensive youth hostels in wonderful old palaces to chic boutique hotels. 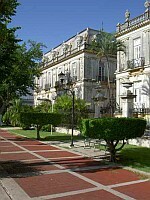 Most have swimming pools, courtyards and are within a short walk of the main plaza. In addition, for those wishing to stay longer it is possible to rent apartments, some with gardens and pools, in the city center or spacious beachside condos within a half hour of the city. Merida really is Mexico's hidden gem and has so much to offer that you may decide not only to visit but to stay in this tropical colonial paradise.